The Nano Series by Kinetics is made of four expert formulas that provide therapy for every nail type. 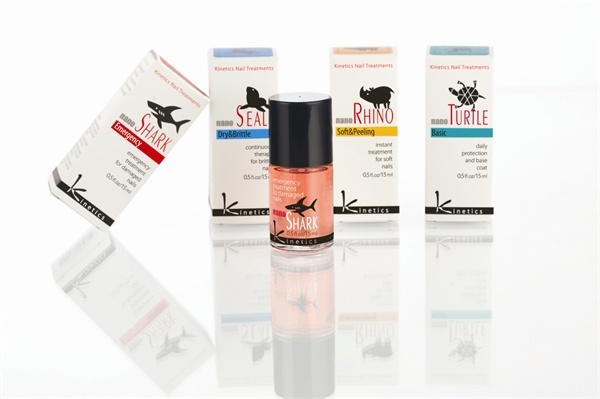 Nano Turtle provides daily protection and is great as a base coat. People with soft or peeling nails will find a friend in Nano Rhino, which builds a second “nail layer” that immediately restores strength. Nano Seal steps in when nails are brittle and malnourished, providing an instant infusion of vitamins A, B5, C, and E. And Nano Shark can attack even the most serious of nail problems: it even hardens nails when applied over polish. For more information, visit Kinetics.